Did you know you could receive over $40,000 to attend the largest university in Alabama? Or get funding to study abroad? Or get a scholarship for doing something you love (like being an athlete in high school)? These are just a few of the scholarship opportunities available to Alabama students. Want to know more? Let us take you through all the financial aid available to Alabama students and the four key steps to get you closer to paying for college. The federal government gives a total of over $150 billion to students like you every year to put toward your tuition. Through the FAFSA, also known as the Free Application for Federal Student Aid, the government distributes tuition aid based on a student’s financial situation. Many colleges also use the FAFSA for some financial aid, scholarships, and grants, so it’s a smart move to fill it out as soon as possible. Tip: you can even complete the FAFSA before you know where you’re going to college or where you’re planning to apply. You may have heard that the FAFSA is very long and can be unnecessarily confusing. That’s why we created a step-by-step guide to completing the FAFSA questions. This guide will take you through each question to help save you time and frustration. While the federal government may provide a substantial amount of financial aid, you should also consider applying for all the state resources available to Alabama residents like you. The Alabama Commission on Higher Education website provides you with information about all that the state of Alabama has to offer. Alabama Student Assistance Program (ASAP) is a need-based program that offers aid to students attending over 80 Alabama institutions. There are also many grants that are offered to Alabama residents. Police Officer’s and Firefighter’s Survivor’s Educational Assistance Program is a grant covering tuition, fees, books, and supplies for students who are dependants or spouses of police officers or firefighters killed in the line of duty. Military Educational Benefits are available for veterans and members of the Alabama National Guard. Don’t forget that scholarships and grants do not need to be repaid. So make sure you take advantage of all that Alabama has to offer students. While Alabama has many state resources, you can find even more funding through local and national scholarships. Talk to your guidance counselor to see if there are any scholarships that you might be eligible for based on interests, heritage, or any other categories that set you apart. You can also find financial resources through the institutions that you apply to. For example, the University of Alabama (UA) has both merit- and need-based scholarships. The National Merit Finalists Package is an extremely generous benefit available to UA students who are also National Merit Finalists. This scholarship includes up to five years of tuition, one year of on-campus housing, a $3,500 stipend, and $2,000 for use in summer research or international study after your first year. There are additional UA merit-scholarships available to students, besides National Merit Scholars awards. You might be able to receive a merit scholarship such as the Collegiate Scholar award or the Presidential Scholar award. These merit-based scholarships range from $10,000 to $41,800 in funding over four years. You could also receive a scholarship for non-merit reasons. For example, the Alumni Scholar Award, gives financial aid to students whose parents or grandparents attended the University of Alabama. The University of Auburn awards about 60% of freshman with scholarships. Their Auburn University Scholarship Opportunity Manager (AUSOM) is an easy way for applicants to apply for internal scholarships. The AUSOM is a comprehensive list of the scholarships that students at the University of Auburn can apply to. These two schools are just examples of some of the in-state financial aid available to Alabama students. Make sure you check out the financial aid websites of schools you plan on applying to. It you still are looking for a way to pay for your tuition, you might want to consider taking out a private student loan. 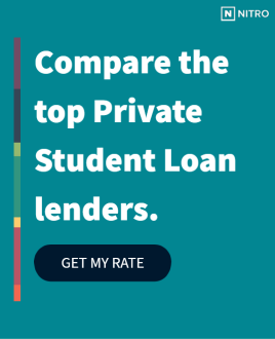 It can be difficult to know where to get the best rate, which is why we’ve found the best banks for private student loans to help you make a smart loan decision. To make things a even easier, we’ve created NitroScore. NitroScore uses information, such as your college, major, expected financial aid, and savings, to predict how much you will be paying for your education loan after you graduate. We know this can be a lot of information to take in, but you are on the right track by researching your options. you are one step closer to educating and financing your future!